This article will guide you through the process of how to set up the hookah properly. Setting up the hookah is a very simple process but, you should be sure that every single part fits properly. Here, you will find step by step instructions as well as some tips for the best shisha smoking experience. If you haven’t already, check out our beginner’s hookah guide you’ll find valuable information out there for total newbies. The main purpose of hookah is to use it to smoke tobacco or any multi-flavored combinations of tobacco. The technology used is quite simple and let’s discuss it in the next part of the article. Each part of the narghile is shown in the image below. 5. A stem or also referred to as the shaft. The above are the basic essentials, which are required to set up a hookah. This is an important thing to know in case you broke something and you need a new part. Let’s dive in a step by step process to understand how to set up a hookah for a thick smoke. You still do not have a hookah? Find out our pick of best hookah in 2019. The first time is always the learning phase of any item. Similarly, for setting up the hookah, this is the first and the foremost step. Care has to be taken, to ensure that the instructions are followed to have a smooth smoking experience. 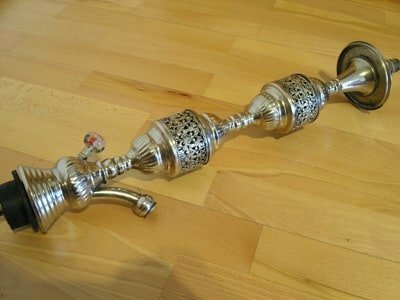 how to clean the nargile and with what? Here the hookah should be washed with a very soft brush. This should be repeated time and again, whenever the hookah gets dirty. All the parts should be washed with care. The brushes form an important part which is required for the maintenance of the hookah. A long thin brush will certainly help reach the inner parts of the hookah, which has long parts. Cleaning is a tedious job. However, to keep good things intact, it is recommended that hookah should be cleaned after each and every session. Can I wash the hookah hose? The hoses can be washed, you need to check whether the hose is made of waterproof materials like silicone and plastic. If the hose has metal parts inside, then it shouldn’t be washed, an example of non-washable hoses are traditional ones. Please note that the hose needs to be dry before use. The vase is found at the base of the hookah and it contains the water. There is a metal stem, which is inside the vase. How much water should I put in the hookah base? The level of water should be an inch or 2.50 cms rising up the down stem. There should be enough space for air to flow through the water. The principle of a hookah is that the smoke should come through the water. The size of the vase decides on how much water should be poured. If the size of the hookah is small, classified as “mini hookah”, then the water in the vase shouldn’t be more than half an inch. Special care should be taken as far as the water level is concerned. Pouring more water will only make harder for you to pull the smoke. This is a “precaution”. Do harmful ingredients stay in the water? It should be noted that the water does not filter the nicotine, nor does it dissolve any chemicals per se. Hence no smokers should be under the feeling that water absorbs the harmful effects of smoking. So filling more water in the vase, will not help in dissolving any chemicals or nicotine. Another important point here to be considered is that the stem extends and touches the bottom of the vase. This is another important setup, which needs to be carefully checked at this point in time. Can I put something else besides water? In some instances, one can also put a few ice-cubes, to have a cooling effect. This is an option, which can be exercised as per the choice of the smokers or users. You can check out our article about the best substitutes for water in the hookah but be careful with the number 4. and 5. on the list. The vase can be made of any material, but most common is glass. There should be a shaft which should touch the base of the vase. This is what is going to carry the smoke. Hence the fitting of the shaft should be perfect. The shaft should have been airtight, hence to achieve this, a piece made of rubber or silicon has to be used which should fit the on the top of the base. This small piece makes a lot of difference for the smoker. If this piece is not air-tight, then the smoke that will come will be thin. This could be a check-point if the smoke is not thick or not as per the user feel and requirement. In case the rubber piece is not fitting properly, check the size or try using water, or soap to fit the rubber piece. This small piece can disturb the smoking experience, hence this should be fitted with care. The hose is the transporter of the smoke to the user. 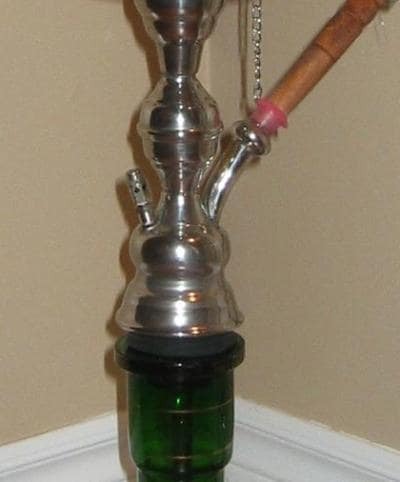 Using high-quality hookah hose and connecting with the right pattern is an important criterion during the set-up of hookah. The shaft has the holes and the hose is fitted to them. It should be ensured that the point where the hose is fitting the holes is airtight, otherwise the flow of air or smoke will be thin. The level of water in the vase should be double checked, as there should not be too much water, it will literally flood the hose, which will lead to the hose getting spoilt. The choice of the material of the hose is also as important as ever. The flow of the air is the most important part of the smoking experience. If air does not flow, then “smoking” is next to impossible. There are some points which need to be checked. The first and the foremost which has to be checked is for the sales. It should be air-tight. What is the best way to check air flow? 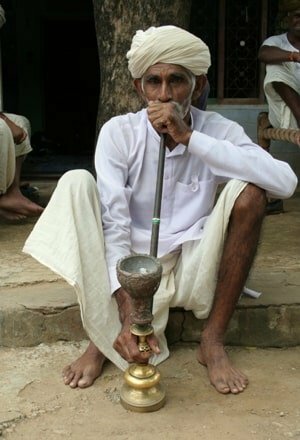 One of the easiest ways to check if the air is flowing or if the seals are airtight, is, place a hand on the hookah stem. Try inhaling, if air comes, then it’s not air-tight. There is another piece called “grommets”. This is placed in between the bowl and the body, there are a gasket and the water jar. This grommet helps in the sealing the joints, from here chances of leakage may arise. This helps in decreasing the air, at the same time increasing the “smoke”, thereby increasing the smoking experience. The work of the tray is to catch any excess tobacco or to catch the embers falling. This does not have any other function, except the one that is mentioned. Shisha is a popular name for hookah tobacco, in most cases, this is a combination of tobacco, glycerine, molasses and some kind of flavor. Simply speaking, the fluid adds a flavor to the experience and at the same time, it emanates a thick smoke, which is supposed to be the best smoking experience that a hookah lover can think of. This shisha liquid tends to be placed on the bottom of the package in which it is located when you buy it. Hence, it is mandatory and imperative, that shisha should be stirred, time and again, so that it stays wet. Try to use a shisha that is tobacco-free. Tobacco is a bit strong and it might have an adverse effect on the first time users, however, a flavored variety can enhance a great feel for the first time users. After the initial feel, one can shift to the tobacco based flavor. The development of flavors for hookah has developed in a very big industry and market. Packing the shisha is also an art. Too much of compactness of the tobacco is not advisable. The air should flow freely. Just filling the bowl with tobacco is fine, but at the same time, there should be some space at the top. If the tobacco is filled too much on the top, then there is a chance that the tobacco might burn. This is one precaution, which is mandatory. This is flagged as a major “precaution” while setting up the hookah. 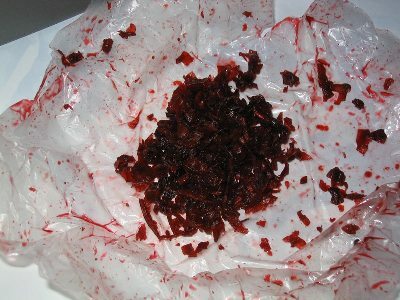 Check out how to pack shisha head properly. An aluminum foil is required to cover the bowl. There are charcoal screens available in the market for this purpose only. Want to know which is better foil or metal screens? Check out our case study. The foil should be closed at the edges to ensure that there is no space left for air to enter from the sides. A small rubber piece has become so important for the hookah to function properly. This bowl should fit with an airtight fitting and this achieved only with the help of a piece of rubber. After covering the bowl with the heavy duty foil, it is important that there should be a passage for air to flow. Hence, it is necessary that holes be made on the foil. The number of holes may vary, however, the minimum holes recommended are in the range of twelve to fifteen. If the air flow has to be increased, then the number of holes can be increased. Some hookah smokers can also make the hole right up to the shisha as well. The quality of coals is very important as, without heat, smoke cannot be produced! There are two types of coal available: Natural and Quick light coals. The quick light coals work instantly, but the heat generated is not sufficient for a long time. On the other hand, natural coals are the best. Though it takes a longer time to reach the heating point, nevertheless, the amount of heat it generates is perfect and it lasts for a long time. The properties which charcoal must have is high density, easy to ignite and the ability to bur longer with constant heat. The placing of the coil on the shisha makes a lot of difference in the smoking experience. It should be placed at the edge of the foil. A common mistake is to place the coils in the middle of the shisha. This will burn or char the foil, which in turn leads to the shisha getting affected. This is not advisable. The best experience is to place the charcoal on the shisha, allow three to five minutes and then start smoking or inhaling. This will result in a smooth feel and experience. The last and the one we have been waiting for. There should be a smooth way to inhale. Too much of hard pull may lead to a lungful of smoke, which might lead to a cough. Finding the right rhythm is the best way to increase the experience of smoking. The use of ice and cold water keeps the temperature of water at a cool temperature. The bowl should be vortex type. The shape of the “vortex” bowl is a bit different as it has a special cone. This helps the fluid from the tobacco stay inside. Tobacco should be of fresh quality and wet, while inhaling, it is important that air should also be exhaled. Using the right amount of coal, having a good heating system and usage of natural coal as the heating are some of the tips which give the best smoking experience. The hookah has taken the world by storm. In fact, because of the success of the hookah, there are a number of hookah parlors which has come up. Keeping in trend the parlors have introduced a variety of flavors which have increased the hookah smokers a lot. The setup process is still the same. However, apart from the setup, it is important that the ambiance of the place where the hookah is going to be used must have a good feel factor. This adds to the smoking experience. We should also know that the top hookah flavors are Al Fakher Mint, Tangiers Noir Cane Mint, Starbuzz blue mist and many more. Did this post help you about how to set up a hookah? If so, leave us a comment below.